Space shuttle Endeavour glistens in the sun on Launch Pad 39A at NASA's Kennedy Space Center in Florida. The shuttle is launching on its final mission, STS-134, on May 16, 2011. CAPE CANAVERAL, Fla. – NASA needs at least a week to make repairs to space shuttle Endeavour before the orbiter can soar on its final mission, making May 8 the earliest launch option, mission managers said today. The space agency called off a launch attempt on Friday (April 29) when a problem was discovered with a power system, called an auxiliary power unit, located in the shuttle's rear section. No new official launch date has been set and NASA decided not to try for its next immediate launch opportunity on Monday -- which it had originally been aiming for -- to allow more time to fix the issue. At least a week of repairs will be needed, the space agency says. Endeavour is slated to fly six astronauts to the International Space Station for a two-week trip to deliver a $2 billion particle detector aimed to study dark matter and other mysteries of the universe. They will also carry a platform packed with spare parts for the orbiting laboratory. Four spacewalks are planned. The cause of Endeavour's latest launch delay (the mission was initially waylaid from an April 19 launch date due to traffic conflicts at the space station) is a pair of malfunctioning heaters in one of the shuttle's three auxiliary power units. The heaters, which prevent the power unit from freezing in orbit, failed - a glitch that would have rendered the critical system useless during flight. Engineers spent the weekend investigating the problem and traced it to a power control box called the aft load control assembly-2. The box will require lengthy repairs and retesting to make sure Endeavour is safe to fly. "We need to go in and change out that box," Moses said. "Once the box comes out we have to verify circuitry and prove the box itself was the failure. We still have a lot of work." Despite the difficulties, NASA is confident it can get the orbiter back to good health. "Responding to problems is one of the things we do best around here, and the team always likes a good challenge," said Mike Leinbach, shuttle launch director. Leinbach said the problem on Endeavour is a fairly typical electronics failure, and didn't have anything to do with the 18-year-old orbiter showing its age. "It's a machine and occasionally machines break," Leinbach said. "That's just part of the business." In scheduling a new liftoff date, NASA must consider not only how long a fix will take to implement, but the schedule here at NASA's Kennedy Space Center, and its neighboring Cape Canaveral Air Force Station, where unmanned rockets lift off. An unmanned Atlas 5 rocket is set to launch May 6, carrying a military surveillance satellite. NASA will likely try to schedule Endeavour's liftoff for after that timeframe. Endeavour's six astronauts, led by commander Mark Kelly, have already left Florida to return to their training center in Houston. 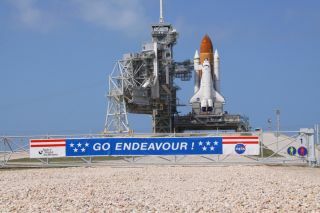 "Hope for a Monday launch is fading ... but the bigger picture is we are ensuring Endeavour is in tip-top shape. We'll fly when she's ready," Endeavour's pilot Gregory H. Johnson wrote on Twitter, where he posts mission updates under the name "Astro_Box." After shuttle Endeavour's flight, NASA has one more space shuttle liftoff planned: the June 28 launch of shuttle Atlantis. As of now, the slip of Endeavour's launch date might not affect Atlantis' timeline, but NASA is cutting it close. "If we launch by the 8th we're probably okay" to lift off Atlantis on June 28th, Leinbach said. "It's getting kind of close but right now we're not worried about it." Following the shuttles' last missions, Endeavour, Atlantis and Discovery will be retired to museums around the country for the public to see. For Endeavour, that means an eventual retirement to the California Science Center in Los Angeles. You can follow SPACE.com senior writer Clara Moskowitz on Twitter @ClaraMoskowitz. Visit SPACE.com for complete coverage of Endeavour's final mission STS-134or follow us @Spacedotcom and on Facebook.